TL;DR: from TCP to UDP. Websocket: Say you want to build a Massive Multiplayer Online Game that needs a huge amount of messages from both ends of the connection. In such a case, WebSockets will perform much, much better. In general, use WebSockets whenever you need a truly low-latency, near realtime connection between the client and the server. HTTP/2: If your use case requires displaying real-time market news, market data, chat applications, etc., relying on HTTP/2 + SSE will provide you with an efficient bidirectional communication channel while reaping the benefits from staying in the HTTP world. "One major goal is to allow the use of a single connection from browsers to a Web site." Multiplexing. Multiple requests are allowed at the same time, on the same connection. Previously, with HTTP/1.1, each transfer would have to wait for other transfers to complete. HTTP/2 is especially useful when dealing with TLS connections. The TLS handshake can be quite long but thanks to reduced latency and multiplexing, other requests can do their work without being blocked. With HTTP/1.1, many techniques were used to speed up websites that are no longer necessary with HTTP/2. Domain Sharding. Loading files from multiple subdomains so that more connections may be established. The increase in parallel file transfers adds to server connection overhead. Image Sprites. Combining image files to reduce requests. The file must be loaded before any image from the file can be shown, and the large image file ties up RAM. dealing with REST APIs, you will no longer have to batch requests. Many of the techniques mentioned above by developers placed additional strain on servers due to extra connections opened by browsers. These connection-related techniques are no longer necessary with HTTP/2. The result is lower bandwidth requirements, less network overhead and lower server memory usage. On mobile phones, multiple TCP connections could cause issues with the mobile network, causing them to drop packets and resubmit requests. The additional requests just added to the server load. 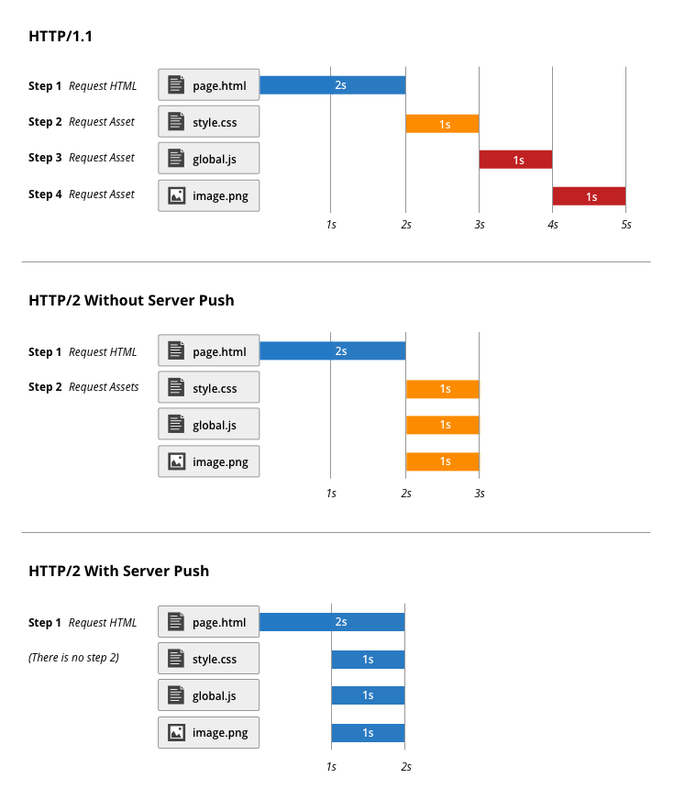 HTTP/2 itself brings benefits for a server, as well. Fewer TCP connections are necessary, as stated above. HTTP/2 is easier to parse, more compact and less error-prone. PUT: update full representation PATCH: modify part of data, PATCH is neither safe nor idempotent. "please give me a json, not xml, if possible"
"the entity attached is a json, please use the correct parser when you(server) receive it"
Use 400 if the request parameters are wrong. Use 412 if one of the If-* request headers like If-Match, If-Modified-Since, etc are wrong.